Please take a moment to view our extensive KW Suspension Systems selection in our new ONLINE SHOP ! Shock absorbers slow down the vibrations generated by wheels, axles and the chassis. Therefore, the technically correct name is vibration damper. When driving over an uneven surface, the shock absorbers take up the impact of the shock. The damper then tries to transfer the incoming energy. In a short time span, these continuing shocks lead to a vibration. These movements are then transferred to the shock absorber by the piston rod. Thereby, the kinetic energy is transformed into heat by hydraulic resistance in the shock absorber valves. Therefore the vibrations are reduced to a minimum and can hardly be sensed. In automobiles, vibration dampers are usually used as twin tube or mono tube shock absorbers. In both cases, the piston moves in a cylinder filled with oil. The piston forces the oil though orifices of different sizes, slowing the movement of the rod, and controlling the spring. With a Twin-Tube shock absorber, the piston works inside of an inner Tube. The space between the inner tube and the casing is used as an equalization chamber. Changes in volume due position of the piston rod change the oil level in the equalization chamber between the outer casing and inner Tube. When the car swings downwards in the direction to the road, the piston rod is moved downwards. The oil displaced by the piston rod is pressed into the equalization chamber between the Tubes via specially designed orifices in the compression valve at the lower end of the inner Tube. The resistance that is created through this valve creates the actual compression forces. Oil underneath the piston also flows upwards through the piston check valve with low resistance which also influences the damper characteristics. When the car swings upwards, away from the road, the shock absorber is extended. The piston rod is extending outward from the housing. 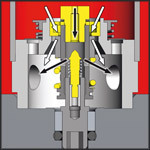 The rebound phase valve at the lower Tube resists the oil that flows downwards through the holes in the space above the Tube. Therefore the upward motion is slowed down. When the piston rod is pulled out of the case, its volume is balanced out by the oil that flows from the equalization chamber back into the inner tube through the compression check valve. With a one-piston shock absorber, the piston works directly in the damping case. 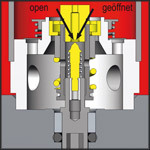 Both, traction and also compression phase valve are integrated into the piston at the end of the piston rod. Depending on the velocity with which the shock absorber is compressed or extended, the forces rise. A characteristic is the separating piston that separates the oil from the gas space which is under strong pressure. The gas space balances the oil expansion with temperature differences and volume changes while the piston rod retracts. The separating piston thereby moves upwards and downwards. The gas pressure of 25-30 bar in the separating space is necessary in order to support the damping forces in direction of the pressure direction. When the car swings downwards in the direction to the road, the piston rod is moved downwards. The compression phase valve on the top of the valve resists the oil that streams upwards through holes. Therefore, the downward movement is slowed down. 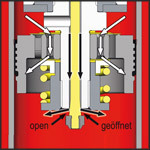 The separating piston is thereby lowered by the same degree as the piston retreats downwards. The gas pressure underneath the separating piston thereby prevents the oils from foaming above the piston. When the car swings upwards, away from the road, the shock absorber is extended. Thereby, the piston rod is moving out of the damping case. The rebound phase valve at the lower piston resists the oil that flows downwards through the holes in the space above the piston. Therefore the upward motion is slowed down. The separating piston is thereby lifted upwards by the same degree as the piston extends. 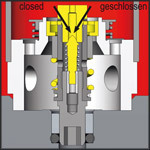 The damping is carried out by the setup-specific preset spring valve at the piston. A sporty and tense adjustment of the traction stage prevents rolling and pitching while braking and accelerating. 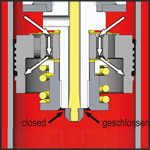 The bypass oil amount (black arrow) is not available anymore for the spring valve at the piston and the damping forces are therefore reduced. 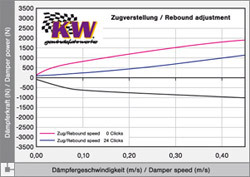 A lower rebound damping improves the driving comfort. Spring- loaded bypass valve of the compression damping in a closed state before the compression stage is activated. A sporty and tense adjustment of the compression stage prevents the vehicle from rolling in curves.